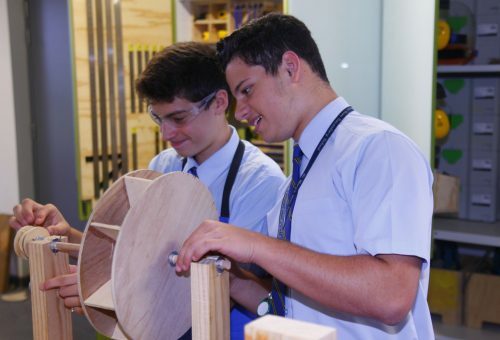 Year 10 Industrial Technology (Engineering) students are studying ‘Alternative Energy’. As part of their practical assessment the boys are required to design and build a working Water Turbine. Some students used computer aided design packages to design and manufacture their gearing systems. Many of the gears have been produced using the Laser Cutter. The Water Turbines are then tested with a ‘dam’ of water located high in the Crichton Building flowing down to the basement in pipes decreasing in size. The “dam” is a plastic container holding approximately 80 litres of water. The water flows a distance of approximately 10 metres out of the window of the top story in the Crichton Building down to the basement in a 19mm pipe which is then converted to a 12mm pipe. As part of their study programme the boys are also taught to use multi meters to measure current and voltage. The students were joined by Ms Chander’s Year 8 Science class who were keen to see the results as well as hearing about the scientific principles involved. The Year 10 boys enjoyed this part of the course immensely as they could get a first-hand appreciation of what it takes to generate electricity.